Energy efficiency is the largest component of the broader advanced energy industry AEE represents — and it’s big business too, representing $70 billion of the total $200 billion in revenue from U.S. advanced energy in 2016. That also translates to 2.2 million people working in energy efficiency across the nation, the biggest portion of more than 3 million total U.S. advanced energy jobs. Given these numbers and the big savings from energy efficiency, consumers, company officials and workers alike should care about doing more to save more. 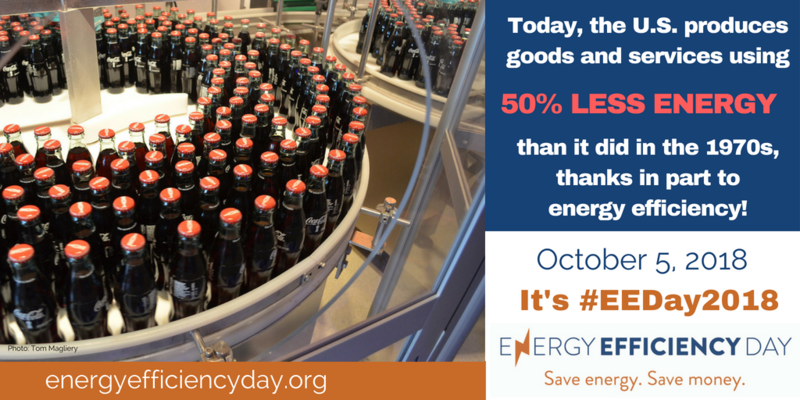 Energy Efficiency day (#EEDay2018) is the perfect campaign to build awareness among your customers about what your company is doing, as well as what they can do. Efficient Lighting and Intelligent Lighting Controls: Lighting accounts for 20% of energy use in commercial buildings and 10% of energy use in residential buildings. Installing efficient lighting is one of the lowest cost, fastest payoff efficiency improvements today. Advanced lighting technology includes light-emitting diodes (LEDs), energy-saving incandescent bulbs, and compact fluorescent lamps (CFLs). Demand Response (DR) is a grid management tool through which utilities and grid operators provide information and, in some cases, incentives to customers to encourage them to reduce energy use at specific times. Combined Heat and Power (CHP) produces electricity and useful heat from the same fuel source in an integrated system. CHP systems recover exhaust or waste heat from electricity generation for use in industrial processes, space heating, and water heating. Efficient Heating, Ventilations and Air Conditioning: Heating, ventilation and air conditioning (HVAC) systems consist of air conditioners, heat pumps, boilers, furnaces, and chillers, as well as the associated controls, air handlers, ductwork, and piping. Improvements in efficiency derive from various technological innovations, such as variable speed drives (which reduce energy use by electric motors) and increased heat exchanger surface area (which improves overall energy transfer to the conditioned space). Join the Campaign: Add your name to the list here. This is free, fast, and you just have to check the box to list your organization's name publicly as a participant. Highlight Your Company’s Successful EE Initiatives: Talk about the technology, products, and programs you’re involved with; spotlight successful projects and your customers or partners. Share EE Activity on Social Media. Highlight #EEDay2018 on your social channels, especially Twitter and Facebook, ahead of, and on day-of, Oct. 5 (and follow those channels too!). Lastly, Be creative! In past years we've seen spontaneous EE haikus, limericks, and movie memes to engage interest. Are you ready to make your EE pledge? Join us for #EEDay2018 now.